My travelling companion on this occasion wanted to do a tour in Belgium whereas I wanted to press on to Germany so we ended up staying near Liège to match both requirements. More photographic difficulties resulted in two uninteresting pictures of Duisburg Entenfang and a strip of negatives blank from frame 22-36! Up at 0415 to head for Cheriton and the 1021 Le Shuttle. Cheriton was reached in comfort by 0930 and we were sent off to the terminal to wait to be called 'starting at 0950'. We dutifully went to the waiting area at 0950 only to be left queueing while the 1021 left. We were put on the 1039 which was no problem in terms of time but was thoroughly annoying after being lectured about non-exchangeable tickets and told that I must travel on the booked train [you must remember, dear reader, that low cost airlines, call centres, and other devices designed to abuse and frustrate the customer were all only in their infancy at this early stage of 'evolution']. The usual sharp exit at Calais had us on the motorway in around 4 minutes, whence we proceeded to Adinkerke for a look at the tramway extension (being worked on but not a lot of progress since Feb.) and De Panne for a visit to the new Cafe Robinson (pleasant for a brand new pub, with an adequate if less than exciting beer list). A mad dash to Koksijde station, which isn't in Koksijde, got us on a train to Dixmuide, thus doing the 2 km or so of realignment which avoids the level crossings at Kaaskerke (a certain amount of skepticism was voiced about this on the Internet but it does exist and the old alignment is clearly visible). 28 minutes at Dixmuide just allowed a brisk walk to the Grote Markt (reconstructed after WW1 but typical Flemish and very attractive) for a swift Hapkin at a pub in the corner of the square. Back at Koksijde we set off for Brussel, Leuven and Liège. It took just an hour to negotiate the traffic jams on the Brussel ring road (note for the future - don't go near it at 1630 on a Friday). Leuven wasn't too good either, and it rained all the way to Liège. Final arrival at the Formule-1 at Liège [well, fairly at - it's on an industrial estate near Milmort station] was 1836 with 24 minutes to spare on our reservations (held until 1900). After some delay we retired to Vaudree II by train to Guillemins and taxi thence, returning from Liège Jonfosse which is a lot nearer. Away on my own at 0830 with the intention of catching 0958 Euskirchen-Trier. Having got lost en route [Goodness knows how - I can usually find my way without too much difficulty] and in Euskirchen, then had difficulty parking, I missed this by about 5 minutes. Having reappraised the day I was fairly irritated to arrive on the platform and find a steam hauled special departing for Trier... Plan B was to head for Wuppertal and do the Danglebahn from Vohwinckel to Wuppertal Hbf. Total failure again, when after the short walk to the Danglebahnhof the D-Bahn was found to be not working. (Recap - journey from Euskirchen was via Bonn, Köln Hbf, Solingen-Ohligs to Vohwinckel). Returned from Vohwinckel to Düsseldorf Hbf on an SE, then another SE to Duisburg Hbf and an RB hence to Duisburg Entenfang. This short non-electrified branch is interesting, running as it does beside or near various electrified freight lines and eventually a very large yard. For a while it forms half of a double track, the other track being electrified. After return to Duisburg I went to Essen Hbf to do the direct S-Bahn line to Düsseldorf (S6). This was supposed to run through to Köln but terminated at Düsseldorf Hbf. Several persons who hadn't heard/understood the announcement stayed on the train but fortunately I understood enough of what a friendly local said to me to get off and find the 1623 to Köln across the platform (this was the booked departure time anyway). 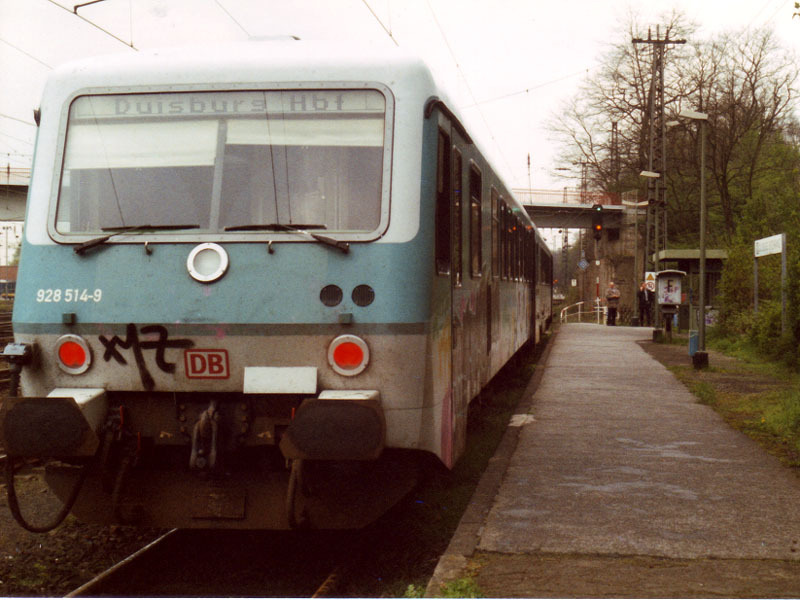 This lost time steadily and was held at a junction outside Köln, resulting ina 30 second connection on to 1721 to Euskirchen. This was shortened still further by inability to find the train on the departure list - the Kursbuch had it as a Trier service but it actually goes to Saarbrücken. Must get a supplement... The DMU to Euskirchen was a small mystery. Newish and with sloping sides it appeared to tilt a lot on the sharper curves. Whether it was a tilting unit or whether the curves have been canted remains to be discovered. If they have, then it's quite a substantial angle. [In retrospect this was probably my first brush with the dreaded class 612]. Yet another 0600 departure, this time to drive to Aachen for the 0712 to Köln. The station buffet and supermarket still open at 0700 Sunday, 0600 other days. Hasty consultation of the departure sheet at Köln failed to reveal that there are two trains at 0813 to Koblenz - in our eagerness to make a 2 minute connection we got the 'wrong' one via the right bank and not the intended one via Remagen. It worked in our favour however, as consultation with the timetable revealed that one of the four Sunday trains via the south bridge at Koblenz connected with our train at Neuwied. Accordingly we changed there and got a bit of extra track. Breakfast was obtained at Koblenz (mayonnaise again) before departure on 1021 to Trier. The rain and murk gradually cleared as we went towards Trier. Irritating to note the Traben-Trarbach connection waiting at Bullay and not having time to take it. At Trier we discovered that the 1151 to Köln was now the 1215 to Köln, presumably retimed to take account of the tilting karts. This allowed time to ring Herself and partake of a Franziskaner Weissbier which proved a Bad Idea in the light of the subsequent white knuckle ride... I arrived at Köln with breakfast still on board but with a very jaundiced view of tilting trains (as in, never again). A very successful grice none the less, with an irritating gap filled in south of Gerolstein. Return to Aachen was via a routine double deck SE, then on by car to Kortrijk where accommodation was found just off Grote Markt which was occupied by a major funfair. Miraculously, parking was also found outside the police station. The Brussel ring road took 9 minutes this time instead of an hour! This was looking like being a busy year and it was only a week before the trusty rucksack emerged to carry my belongings (eventually) to the Netherlands, Germany and Belgium.